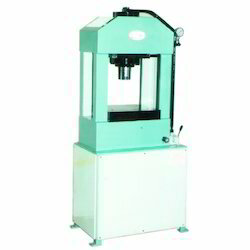 Leading Manufacturer of hydraulic press for coin from Mumbai. Our client centric approaches have enabled us to touch a good height of repute in the concerned domain. Hydraulic Press for Coin that we manufacture and export is finest quality and under astute guidance of our professionals, this range is prepared. Because of this, our range is high on demand. Looking for Hydraulic Press for Coin ?